The Rolling Stones face a battle to win a $12.7m (£7.9m) insurance claim for the concerts they postponed when Mick Jagger's girlfriend died. L'Wren Scott took her own life in March, prompting the Stones to postpone a tour of Australia and New Zealand. The group had taken out a policy to be paid in the event shows were cancelled due to the death of family members or others, including Scott. But underwriters say Scott's death may not be covered by the policy. In denying the claim, they say Scott might have been suffering from a pre-existing mental illness which could invalidate the policy. The 12 underwriters have now won permission to seek evidence in Utah - the state where Scott was born and raised - about the fashion designer's mental health. A federal judge has allowed the underwriters to gather testimony and documents from Scott's brother, Randall Bambrough. Bambrough told the AP news agency that he did not know about the court case naming him and had not been contacted to provide information about his sister. According to documents filed in the court case, Jagger was "diagnosed as suffering from acute traumatic stress disorder" after Scott's death, and was advised by doctors not to perform for at least 30 days. 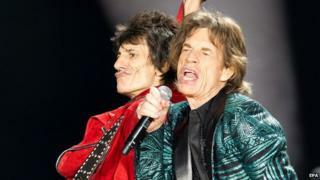 But they had to cancel their Melbourne concert on Saturday after Jagger developed a throat infection. The singer, 71, is under strict doctor's orders to rest his vocal cords, according to an official statement. The veteran rock band is due to play in Sydney on 12 November. All fans who purchased tickets through Ticketmaster will receive a refund for the Melbourne show, according to the organisers.